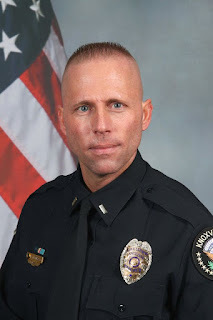 This afternoon at approximately 4:00 p.m., the wife of Knoxville Police Department Lt. Robert Hembree arrived at their residence where she discovered her husband suffering from some type of medical problem. Rural Metro Ambulance responded to the residence and transported Lt. Hembree to Physicians Regional Medical Center where he died just minutes after arriving. It is unknown at this time what caused Lt. Hembree’s death. An autopsy will be performed tomorrow to determine the cause of death. Lt. Hembree, 42, has served with the Knoxville Police Department since January 1997. Lt. Hembree is the West District C Squad supervisor. Lt. Hembree is survived by his wife of 7 years, two sisters, and his parents who are missionaries and are currently in Romania. There are no children. Arrangements will be announced as soon as they have been finalized.